Winter has passed and spring is here and it’s time to get out of the indoor arena, to hit the trails again or start legging up for the summer show season. Unfortunately, the long-awaited changing of the seasons can spell danger to horses on pasture. But by being aware of the potential problems and taking steps to protect your horses from them, you can still enjoy the season. Since not all horses grazing a spring pasture will experience problems like colic and laminitis, it is reasonable to assume that certain horses are more susceptible than others to the ingestion of NSC (especially fructan) in grasses. Horses that are obese or insulin resistant due to disease (such as Equine Cushing’s Syndrome or Equine Metabolic Syndrome), appear to be more susceptible than those with more moderate body condition and normal insulin sensitivity. Several conditions associated with being overweight or insulin resistant could exacerbate the effect of fructan and starch in the hindgut, including increased stress on the hoof due to high body weight; the existence of a pro-inflammatory state which makes them more apt to produce an extreme inflammatory response; reduced glucose delivery to the cells of the lamina of the hoof; alteration in blood flow to the hoof; and/or changes in the function of the cells lining the blood vessels in the hoof.Prevention of pasture-associated laminitis and colic is relatively simple in theory but can be very challenging in practice. Limiting access to pastures during periods when NSC levels can be expected to be high (late spring, days that are sunny and cool, and during the late afternoon) is ideal. However, for many horse owners this may not be practical. 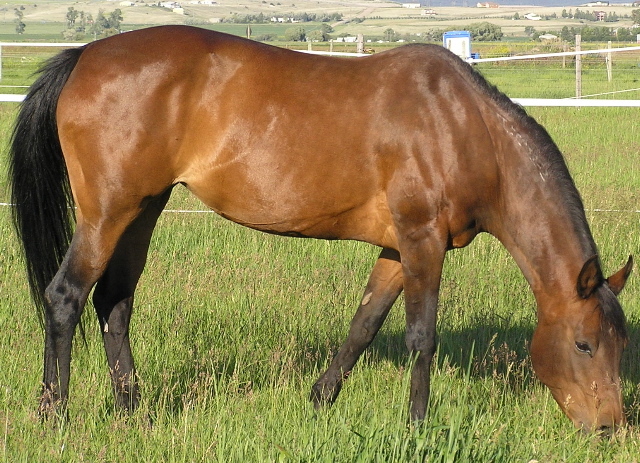 Alternatives to restricting pasture access include mowing pastures, building partitions in the pasture to limit the space where horses may graze lush grass, moving horses to shaded pastures, using grazing muzzles, limiting turnout times (2 to 4 hours per day), and feeding supplemental hay and concentrates to curb hunger with the hope of limiting pasture consumption. Maintaining horses in ideal body condition (BCS 4.5 to 6) may be one of the most important ways to minimize the risk of pasture associated laminitis and colic. (Go to www.horse.purinamills.com for more information about body condition scoring and weight management techniques). A regular, consistent exercise program is beneficial in controlling weight as well as stimulating gut motility which may help decrease the risk of colic. Being aware of the dangers associated with spring pastures and taking steps to protect your horses from them helps everyone to enjoy the season. This entry was posted on Monday, April 2nd, 2018 at 9:05 am	and is filed under News & Updates. You can follow any responses to this entry through the RSS 2.0 feed. Both comments and pings are currently closed.